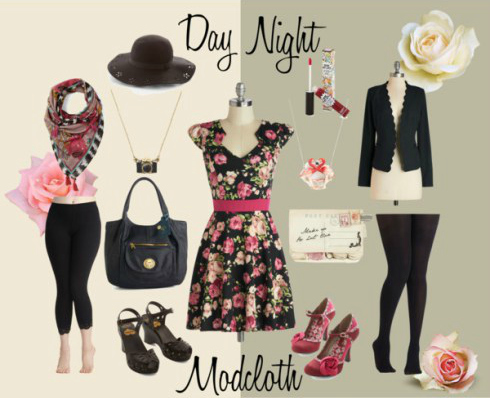 Recently I was asked by ModCloth to style as Polyvore set, based around one of their favourite dresses. The Story of Citrus dress is a cute floral dress, which is a really pretty and versatile dress which not only comes in a gorgeous rose print but also a range of other prints and colours. I was asked to pair the dress up with a selection of accessories from the site. I decided to style the dress for both day and night, as I would wear the dress for both. The colours are great for autumn and I tried to make outfits that would work perfectly for the season. For the day I added a casual scarf as it makes the dress look less formal and adds a little warmth as the weather gets chillier. I included a black hat as they are everywhere this season and look great with most outfits. I thought the dress would look nice with some black leggings and a pair of Swedish Hasbeens which add a little vintage charm to the outfit, they look amazing with everything. The bag I chose is big and casual. I always use really big bags in the day time as I usually have my camera, a book and sometimes my laptop as well as all my other things. I loved the little camera necklace and thought it would be perfect to finish off the outfit, it’s a great necklace for a blogger! For the night-time look I wanted to add some fun and quirky accessories and create a smart but playful outfit. Firstly I thought a dark lip-gloss would instantly add a little glamour to the dress. I thought it would look great worn with a pair of black tights, as the evenings are getting colder. The pinky red coloured shoes go perfectly with the dress as they pick up both of the rose shades and also pick up the lighter creams in the bag and necklace I chose. The clutch bag was chosen because it’s really cute and not too formal for a fun evening outfit. Again I picked the flamingo necklace as it’s fun and quirky, but still a good colour to go with the dress. Finally the jacket with it’s pretty scalloped detail would look great with this outfit and keep the cold at bay. ModCloth have a fabulous range of dresses available. Some are perfect for creating a vintage look, and they have lot’s of fabulous colours and prints. They also have a plus size range so there’s something for every shape and size. Find the full range of ModCloth dresses here. Although based in the US they also ship to the UK. There are so many great dresses and skirts that I have my eye on, and I’m hoping will make it to my wardrobe very soon! Do you like to wear your dresses for both day and night? What accessories do you use to adapt your outfits and which look would you choose?